For this game at The Source, the Centurions wargame club welcomed guest gamemaster, Mike Whitaker (co-host of the Meeples and Miniatures Podcast) who ran a demo game of the Too Fat Lardies rules, "I Ain't Been Shot Mum". A company of infantry with armor support on each side provided an afternoon of great entertainment. We'll be playing these rules again. Mike Whitaker, guest gamemaster for the day, introduces the scenario to the German commanders. In the rear of the American position, hedged fields provide cover for a fall-back position, and a small village becomes company HQ. One of the lines of German approach; a covered lane that leads to a walled farm and a chateau. The middle of the field as viewed from the other German entry point, on the left. and the adjacent woods, where they also place a Forward Observer for the battalion 105s. Third platoon takes up positions in the farm and the adjacent fields. First platoon remained with the company HQ, in reserve. The Germans enter through the woods on blinds, one of the players cleverly disguising an approaching platoon by placing a tree on top of it. The Americans were not fooled. The covered lane provides little cover for a platoon of Panzer IVs, which are promptly hit with artillery. A couple get minor damage, but one of them gets a blown track, blocking the lane. The remaining three Panzers scramble into the woods, bypassing the disabled tank. 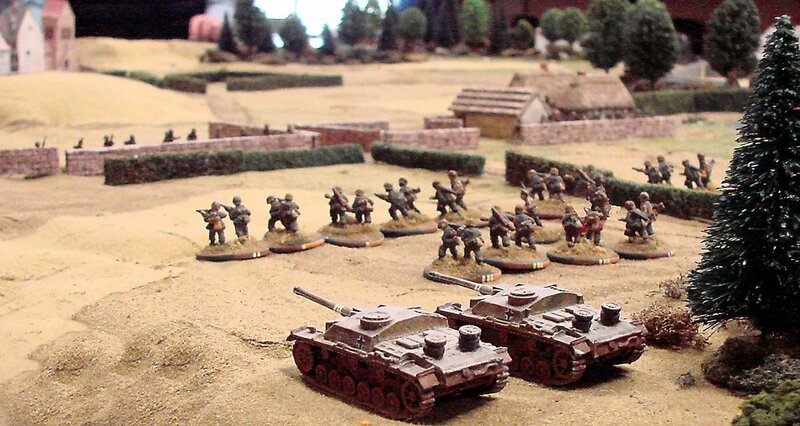 On the left flank, an advancing platoon is supported by a couple SturmGeschutzen. A pair of American 57mm anti-tank guns stationed on a knoll in the second line spot the advancing armor, and open fire. One of the German players tells the other not to worry - "they're not effective at that range". Apparently they actually are effective at that range. A bazooka team attached to the 3rd platoon soon damages the other. German mortar fire begins to drop on the anti-tank gun teams, causing some confusion but no casualties. Back on the right flank the Panzers have sorted themselves out after the artillery barrage, and cover the flank of their infantry. The advance on the chateau rolls forward while, unfortunately for the defenders, the battalion artillery is occupied with other targets. As the German advance on the right approaches their target, the platoons on the left (now without armor support) execute a perfect pin-and-close-assault on the walled farm, and the Americans are driven out. The Germans occupy the farm, only to be ripped by the fire of 50 caliber machine guns in the American second line. On the right, armor pounds the chateau with high explosives while the infantry drives into the adjacent woods. American reinforcements arrive just as the Germans are consolidating their gains, and they are forced to abandon the farm. One of the Shermans takes out the remaining StuG. The Allied infantry from the first line have taken a beating, but there is a fresh platoon in reserve, and the Germans only have three Panzers left to face five Shermans and two anti-tank guns. Stalemate, pretty much. We'll do better next time, no doubt. The Axis commanders ponder what went well, and what didn't. Basically, the Americans held the first line too long, taking too many casualties, but the Germans lost half their armor support before they could have much effect. The scenario pitted an American company in defence against a German attack, in some far flung corner of the Ardennes in winter '44. Snowy table, sadly, unavailable, (barring Photoshop trickery!). Fitz (aided by Elliot and N (argh, blanking on names)) took the Germans, and Jeff and... hrm, I should have taken notes!... the Americans. The latter deployed two platoons across an obvious defensive hedge/wall/building line, holding a third in reserve back at the village. The Germans advanced across a wide front down both roads, one side with a platoon backed with a pair of StugIIIs, the other four PzIVs, while two full platoons pushed through the woods and downslope. Their pre-game stonk hit the obvious targets (farm and chateau), and caused a fair amount of shock. The Americans retaliated with some 105mm battery fire, which blew a track off one of the Panzers and somewhat discomfited the other. The Axis advance took a fair amount of fire from the defensive line, but the key breakthrough came when, under MG, tank and mortar fire, one of the American sections in the farm was pinned, and a somewhat unintentional and lucky close assault drove them out. The Germans then consolidated their attack, by which time frantic requests for support from the Americans had turned up a troop of Shermans including a '76, as well as revealing two 50cals on tripods and a pair of 57mm AT guns on a hill in back of the defensive line. Cue derisory German comments about the efficacy of 57mms. Cue a brewed up StuG. The second StuG got brewed by the Shermans not long after, leaving an interesting position in which the Germans had hold of their initial objective, but the Americans were falling back to their command HQ, under cover from the Shermans, 57mms, and 50cals. It would have been interesting to see what happened next. Much positive feedback - most of the group hadn't played IABSM before, and I think they enjoyed both the mechanics and the feel of the system. Thanks again to Jeff and the Centurions, and The Source Comics and Games shop for hosting the game.